Oh, no! 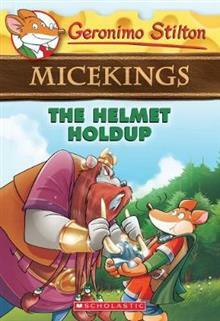 One of the special miceking helmets in miceking leader Sven the Shouter's private collection has been stolen! Could it have been taken by the vilekings-the rival mouse clan? The micekings journey to the vilekings' village to find out... and while they're there, the dragon... read full description below. Oh, no! One of the special miceking helmets in miceking leader Sven the Shouter's private collection has been stolen! Could it have been taken by the vilekings-the rival mouse clan? The micekings journey to the vilekings' village to find out... and while they're there, the dragons attack! Can all the mice work together to save their fur?